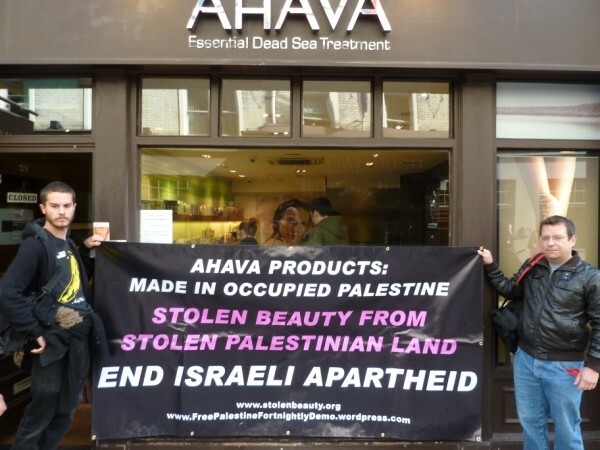 The BDS movement celebrates another victory this week as the Israeli cosmetics company Ahava is forced to move its London location. Read more about the boycott of Ahava here. The central London flagship store of Ahava, an Israeli cosmetics company whose products come from stolen Palestinian natural resources in the occupied West Bank, and are produced in the illegal settlement of Mitzpe Shalem, has been forced to move following a sustained campaign from BDS activists. Demonstrations have been taking place outside the shop every fortnight since March 13 2010, following a call to action from the Bil’in’s Popular Committee. The first action against Ahava took place in January 2009. The news first came to light last week during a court case resulting from the fifth successful blockade of the shop in November. Ahava has vowed to open a new shop elsewhere in London. Campaigners have vowed to continue the campaign. Visit www.bdsmovement.net for more information.